like riding the sightseeing streetcar in Vancouver. 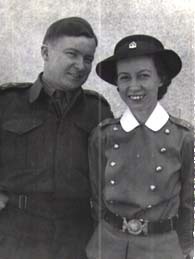 Here are Maude and Roy Parrett, making like tourists in August 1943, Roy being stationed in the artillery at Manitoba Agricultural College, which has been turned into an Artillery Training Centre. Here are Maude and Roy Parrett riding a sightseeing streetcar in Vancouver in 1943 with Charlie Straw a popular guide on the sightseeing cars- he delivered a running commentary for the visitors, and yes, he wore a distinctive straw hat! By 1943 we Parretts were all in the army- Roy in the artillery at Shilo Camp, Stan in the 1st Regiment RCHA in Italy, and Mabel (Mamie) a nursing sister. Soon we were all serving overseas, we visited the Purchase relatives in England, and managed a few outings in wartime London, sometimes during air raides. Artillery training on Salisbury Plain wasn't easy! In the blackout we often got lost- no roadsigns! This was artillery training on Salisbury Plain in England- a place much like Shilo in Manitoba! 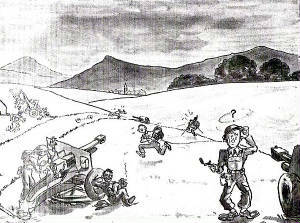 We also had an artillery school at Seaford, Sussex- by the sea, and, fortunatly, most of my traing time was at Seaford!